Well, here we are then … we arrived in Edinburgh on Sunday (July 27th) and found our digs. They are not quite as salubrious as they looked in the photos but hey – ho! This is my room … well, half a room to be honest, I can’t get into one half of it without crawling! I’m quite good at crawling but even so. Anyway enough moaning! We wandered down to George Square Gardens to meet up with the Assembly crew … who are all lovely, helpful and unbelievably professional! Exactly what we expected but it is still quite nice when they are as good as you thought they were going to be. We had a look at the space, we met the admin team … well, some of them, who again are all fab and professional. We then went for food and a beer … there might be a lot of this in the Edinburgh Diary! We didn’t tech till 7 pm so the first part of the day consisted of “moving the van” (there will also be a lot of this in the diary too; parking where we “live” is rubbish), sending hundreds of e mails, Twitter, Facebook, etc. Then running to the newsagents to buy the Guardian as we knew we had an article in there. I don’t know if you’ve seen it but it is an amazing article … double page spread in G2 and a line above the masthead on the front page … Noggin Rides Again! Woohoo! Then, of course, we had our Kickstarter campaign to work on … gosh what busy boys we were. I sat at the computer until I could sit at the computer no more! And … many of you probably already know … we reached our target … Tony and my self had found a public house to have food and a beer (so soon, so soon) and as we chatted I had one eye on Kickstarter and was constantly e mailing, Twittering, Facebooking, etc … then … at about 10.30 pm … we made it … we made it. Some wonderful and generous people helped to raise £4,000 to make this Edinburgh Adventure work without us being sent to the workhouse! 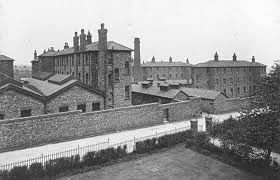 This is a picture of the workhouse that we are not being sent to! Phew! And thank you to all of you theatre angels! 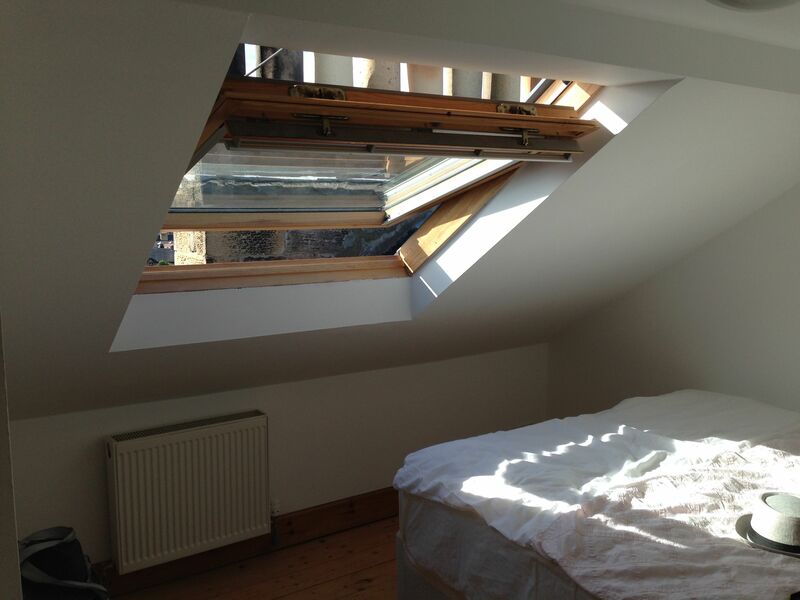 Tuesday was a day of repairs and flyering and sorting out problems and banging my head on the skylight in my half a room … “Crikey,” I said, “that was rather painful!” … or something like that. Nick arrived from his sojourn in Kansas … doing his one man show at a festival and we talked him through the space, the problems and he, being jet-lagged, sort of ignored us … which I thought was fair enough! I also had a bit of me-time … I went for a walk … the castle, the royal mile, the National Gallery, and then home to eat at home … no Public House, I hear you shout … indeed … no public house … we ate at home! Thursday … the first preview. Arrived at George Square in the rain, flyered everyone who was daft enough to be out in it and got ourselves ready to do the mad dash. We basically have about 15 minutes to get the whole show up and running; that is everything … the set up, the props set, costumes on, projectors plugged in and set up and actors ready to start! We did it with almost 7 seconds to spare! We had a lovely audience … almost half full, which was great for the first preview! The show went really well though there were a couple of technical problems … like not being able to find a puppet amongst all the bits of props and set that we had piled round the back during the show … it was fine, Ronf just came on a few seconds late. So, all in all a very successful first go. Friday (today) … we had slightly more time to set up and tech a few of the little problems that occurred during the first show. The audience arrived and were really nice; about the same size as yesterdays … in number not stature … and there were no major problems, although Groliffe the ice dragon had a mouth moment. Tony has been to the dragon stores and bought more dragon glue and he is, as I sit and write this behind the theatre whilst one show comes down and another sets up, repairing poor old Groliffe. Yes, it is a tent … well, sort of; it is an old Dutch tent from early twentieth century that was designed, made and toured in by a Dutch Circus family. It has a wooden floor, with raked seating, wooden walls, a canvas roof and more technology stuffed into it than you could shake a stick at (hanging from the ceilings, the walls and piled in corners everywhere). Behind the tent … I’ll put some photos up another time … there are a series of sheds, quite big sheds, that are dressing rooms (2), a tech shed (which seems to have lots of black things piled up with flashing lights on them and about a million cables that snake around all over the place), a biggish shed for all of the companies to store their electrical equipment and other stuff that wouldn’t work as well if it got wet or had been stolen (Groliffe lives in there). And there is a green room … er … green “space” that is sort of covered with canvas, tarpaulins and Fosters Lager umbrellas! Perfect. I am now going to go flying again … we have to get as many bums on seats as we can … so, here I go. See you later! ← It is Bob-A-Nog Week!